Set the style bar high by wearing this saree from the house of De Marca. It comes with a trendy embroidered pattern along with a fine color combination, thus lending it a classy appeal. 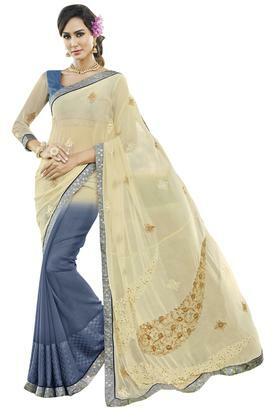 Crafted from georgette fabric, it assures a luxurious finish. Add to your party wear collection this saree. Team it with a pair of matching sandals to complete your look.